NEW YORK, July 20, 2016— Last week, El Salvador’s Supreme Court overturned the country’s General Amnesty Law enacted in 1993, which served as a blanket amnesty for all crimes committed by the parties during the country’s 12-year civil war. The top court declared provisions of the law “unconstitutional” and in violation of El Salvador’s international obligations under the American Convention on Human Rights and the Geneva Conventions. It also ruled that the statute of limitations does not apply to crimes against humanity. “The court’s decision is a major advance in the fight against impunity. It also belatedly vindicates the victims’ right to justice,” said David Tolbert, President of the International Center for Transitional Justice. The Supreme Court’s ruling came in response to a 2013 constitutional challenge put forward by the Institute of Human Rights of the Central American University, a Jesuit university in San Salvador. Human rights and victims’ groups have worked for years to have the amnesty law annulled. The high court’s decision is in line with the 2012 ruling of the Inter-American Court of Human Rights, which found that El Salvador’s amnesty law did not cover the El Mozote Massacre, when soldiers killed more than 1,000 people in El Mozote and surrounding villages in 1981. Nearly half the victims were children. In that ruling, El Salvador was ordered to investigate the incident, which is considered the single worst massacre of the civil war, and bring those responsible to justice. Survivors of the massacre, victims’ families and thousands of other victims continue to suffer the consequences of the war, while the perpetrators remain free. The nation as a whole suffers, too, as the pervasive violence and minimal judicial response that plague the country today have roots in the culture of impunity that has surrounded the atrocities of the civil war. Salvadoran judicial authorities are now obligated to work with victims and their lawyers to devise an approach to the investigation and prosecution of crimes against humanity and war crimes committed during the war in a way that helps to restore the confidence of victims and society in the justice system as a whole. “Criminal processes, hopefully, will lead to an end to the culture of impunity that now pervades El Salvador. Moreover, the trials will contribute to strengthening the national judicial system,” said Tolbert. The Truth Commission for El Salvador had the task of investigating and analyzing serious acts of violence that occurred in El Salvador between January 1980 and July 1991. It determined that thousands of people had been extra-judicially executed, tortured or forcibly disappeared during the conflict. The commission found that state security forces and associated death squads and paramilitary groups were responsible for the majority of cases that had been presented to it. 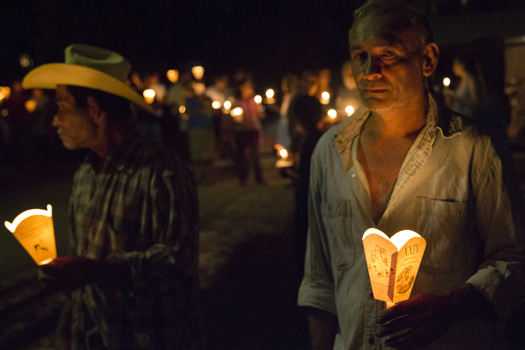 PHOTO: Santa Marta residents attend the candlelit procession and vigil at the end of the sixth annual International Tribunal for Restorative Justice in El Salvador. The Tribunal brings together survivors of human rights violations committed during the country’s civil war to share their stories and calls for justice (Unfinished Sentences).